Here are my predictions for the C-USA for 2022. They are listed by predicted conference record. The offense/defense/special team rankings come from this spreadsheet. I broke down the formula from the spreadsheet into sections to make the unit (backfield, receivers, etc) rankings. Old Dominion will be a very interesting team this year. Worst ranked offense in the conference but second best defense led by two 5.0/5.0 SR CBs. UTEP will also be interesting with LamboThrone coaching them now. And if anyone is wondering why I put North Texas as #9 despite having the 3rd best offense and 4th best defense, it's because they have been a top 3 team in the conference every season in terms of roster talent but usually end up with 2-3 wins somehow. So many of our rival Texas schools in C-USA, so this definitely piques my interest. Great read. 1st season for me. When are transfers scheduled to happen? Could be as soon as this weekend. Really gonna need my defense to carry me through the season. This offense, especially the line, is definitely going to be a multi year rebuild. 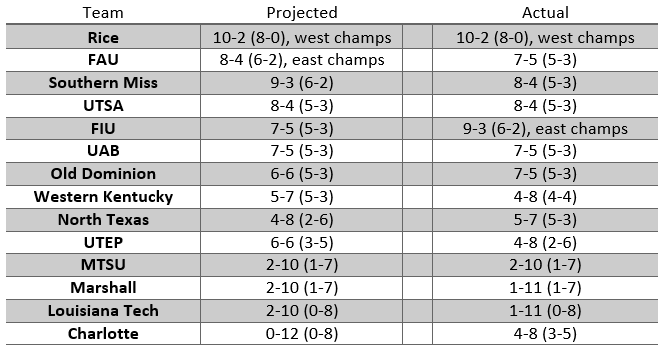 My projections were pretty good across the board except for Charlotte. They didn't repeat the disaster from last season like I was expecting. Also I was expecting FAU to barely edge out FIU to win the East but it was the other way around.